(by Matthew Williams) The Arab revolutions and the subsequent overlapping wars which have plunged the Middle East and North Africa into a fresh wave of bloodshed has catalysed a dramatic surge in jihadist violence across the region. The shockwaves of the Middle Eastern wars have been felt across Europe in the guise of the horrifying attacks in European cities and the worst refugee crisis to effect the continent since the Second World War. The results have been devastating for the Middle East. 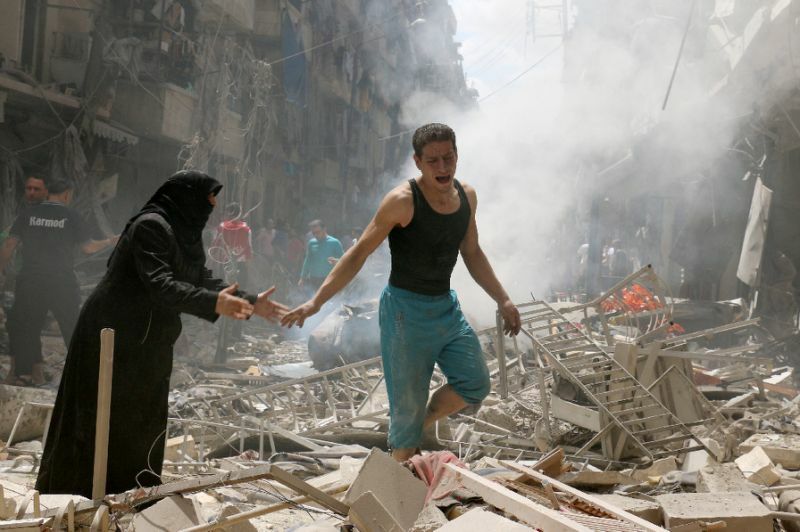 Half a million Syrians are estimated to have been killed in the Syrian Civil War, Libya lies shattered by revolution and two civil wars, Yemen stands on the brink of famine after a year of civil war and Iraq is being destroyed by tribal and ethno-nationalist conflict and ripped asunder by suicide bombings. These civil wars have come to be defined by immense brutality and slaughter while states such as Egypt, Bahrain, and Turkey repress activism, target journalists, suppress dissent and imprison protestors while the states of Lebanon and Jordan buckle under the strain of the huge influx of refugees. Meanwhile the Israeli-Palestinian conflict seethes and bubbles beneath the surface as the 2014 Gaza war and the confrontations between Hizbullah and Israel in March 2015 illustrated how the Arab-Israeli conflict remains a dangerous blindspot in the Middle Eastern wars for Western and international policymakers. The Middle East is awash with blood and untold numbers have died beneath the heals of counter-revolution, state-sponsored violence, suicide bombings and civil war. As the Middle Eastern wars rage, ISIS and Al-Qa’ida have reemerged spreading a hard-line and intolerant doctrine of pan-Islamic nationalism and neo-Wahabbism. ISIS’s twisted blend of revolutionary ultra-violence, swift territorial expansion across large swathes of Syria and Iraq and establishment of a mini-state under Abu Bakr al-Baghdadi changed the dynamics of the Syrian Civil War and the political scene in Iraq. In parallel, their rivals Al-Qa’ida, Jahbat al-Nusa, and Al-Qa’ida in the Arabian Peninsula have made considerable gains in Syria and Yemen by embedding themselves within anti-government forces, controlling territory and influencing local politics. ISIS as Hugh Roberts contends, one element in two horrific conflicts, ‘most resemble…the Taliban (and) while their movement has been fighting states whose Islamic credentials they deny, they have been constructing a new state in remote regions where the former central power has, at least temporarily, lost all purchase.’ While the groups despise each other and are locked in a bloody conflict in Afghanistan, they are similar in their strategies to control territory. Both are also similar in they are not monolithic organisations. Instead they comprise different factions and militant groups with different contextual factors influencing their agendas. However the development of Baghdadi and Zarqawi in Afghanistan is useful in understanding the structure of ISIS. In 1999, following his release from prison in Jordan, Zarqawi returned to Afghanistan where he and Baghdadi began to live and work together, operating as close partners in Kabul and Herat. Baghdadi had close relations with the Taliban during his years in Afghanistan, as did Zarqawi. The two Arabs shared the Taliban’s sectarian hatred of Iranians and Shiites. Baghadi did not emerge from the shadows following Zarqawi’s death in June, 2006. His association with the creation of ISIS’s violent pan-Islamic nationalism and neo-Wahabbist doctrine started in Afghanistan where Zarqawi and Baghdadi would establish a frosty relationship with Bin Laden and Zawahiri. This strained relationship was circumvented by short-term necessities as Bin Laden’s Al-Qa’ida funded their operations in Afghanistan. While Baghdadi hatred of Iraq’s Shiite-dominated government was undisputed, he understood, as did Saddam Hussein, the fundamental importance of maintaining a system of terror and enticement, dependence and conformity, and strong patronage networks. These tenants formed the backbone of Saddam’s regime in its final decade in power following Washington’s obliteration of Iraq’s socio-economic fabric and infrastructure during the First Gulf War and the subsequent international sanctions imposed on Saddam’s regime. As an Iraqi and coming from a tribe with strong links to the former Ba’athist regime, Baghdadi understood these networks better than Zarqawi who had a reputation both as a foreign fighter and coming from a background of poor education. Zarqawi gradually gave the U.S military opportunities to crush the presence of Al-Qa’ida and its horrific sub-cell Jama’at al-Tahwid. It also led to his death, as senior American sources said that key assistance in hunting down and killing Zarqawi came from dissident Iraqi Sunnis who were growing wary about the consequences of tolerating his savage and indiscriminate violence. Zarqawi’s coalition of foreign fighters were too extreme and it alienated Sunni nationalists from any potential political process. Following his death the U.S military under General Petraeus drove Al-Qa’ida underground during the Surge and its leadership was decimated by U.S Special Forces under the jurisdiction of the Obama administration. This reached its climax on April 18th, 2010 when the new leaders of Al-Qa’ida in Iraq, Abu Ayyub al-Masri and Abu Abdullah al-Rashid al-Baghdadi, were killed. Baghdadi’s ISIS has learnt its lessons from the Taliban and the eventual strategic failing of Zarqawi and Al-Qa’ida during the Iraq War. The group has continued Zarqawi’s legacy of violence while rooting itself in local and regional conflicts and Syria and Iraq’s war economies. Those who disagree with their doctrine remain targets including Shiites, Alawites, Yezidis and non-Islamist Sunnis, however they have been careful not to assassinate or target Sunni tribal leaders which, under long existing tribal codes, would warrant retribution. This has opened the door to increased systematic cooperation and allowed ISIS to increase its man-power and economic opportunity in cooperation with tribal groups subordinated to Baghdadi’s caliphate. This mutual enterprise is working despite ISIS’s controlling ‘strips of the most impoverished and sparsely populated parts of Iraq and Syria.’ ISIS control over key trade routes on the Syrian-Turkish border, the Iraqi-Syrian border, and the Jordanian-Iraqi border have allowed it to benefit from the smuggling networks in the Middle East’s borderlands while local tribal groups are able to collect revenue by taxing or extorting traders and travellers. Iraq, in-particular, has been dependent on consumer and industrial imports since the 1950s and the collapse of oil prices has made the central government almost 100 per cent dependent on oil revenue. Certain Sunni tribal groups have used a combination of decentralised economic opportunities provided by the long-standing Iraqi war economy and identity-based grievances as political leverage against the central government in Iraq and Syria. This has helped catalyse ISIS’s unprecedented expansion in the Middle East, while Ba’athist loyalists within the Army of the Men of the Naqshbandi Order have helped ISIS establish a lethal military and governmental structure. Alongside local and regional developments, ISIS’s eradication of physical borders and the ascension of globalisation and technological revolution allowed the terrorist organisation to advocate the establishment of a caliphate across the globe. These have had terrifying implications for Europe as home-grown radical and terrorist sub-cells are being established by European nationals and/or foreign fighters returning home from Syria and Iraq (as supposed to Afghanistan and Pakistan in the 1990s). Scattered across Europe, difficult to track, and fuelled by a matrix of contextual factors under the guise of holy war these cells, inspired by Baghdadi and Zarqawi’s doctrine, have been eager to replicate their brutal tactics. ISIS will not be able to establish a caliphate, however it will be capable of conducting attacks as illustrated by the series of attacks across Paris and Brussels in 2015 and 2016. The Iraq war (2003 – 2011) was an incubator for this type of warfare and the violence striking European cities including Brussels, Paris, London, and Madrid is a microcosm of Zarqawi’s war in Iraq. It is designed to foment religious and racial war, strengthen hardliners and create disorder. This instability is exploited by different radical groups. Such attacks result in security being tightened, refugees, the vilification of opposition and minorities under crude stereotypes, the conducting of military arrests and operations which often kill more civilians, and terrorists, their affiliates, and potential suspects are hunted which frequently becomes a justification for violating and eradicating human rights. More disturbingly in Europe it empowers hard-right and right-wing politicians, journalists and commentators who seek to exploit these atrocities to advance unnerving political agendas, ideologies, and policies. Modern Islamic extremism is complex. ISIS cannot survive as functioning state in Iraq and Syria. It has made too many enemies beyond Iraq and Syria. However the destruction of its self-proclaimed caliphate will not mark an end to the Middle East turmoil. Stretching from Pakistan to Tunisia, an assortment of states have become destabilised, this is ‘the result of allowing tribes to contest state authority’ creating countries ‘prone to bouts of serious internecine violence. Such violence can also cross borders, especially if neighbouring states are willing to use the tribes as their own agents.’ (Steve Simon, 2008)This has been catalysed by Western policies which have promoted regime change in Syria, Iraq, Afghanistan, Libya and beyond through invasion, covert war, occupation, channelling weapons and resources into volatile anti-government insurgent groups or propping up regimes hated by the wider population. Saudi, Turkish, Syrian, Iranian, Pakistani and Iraqi authorities have been content with using local disputes, jihadists and militias in geo-politics with the connivance of Western and Russian policymakers. This has produced calamitous results as warlordism, retribalisation, sectarianism, militia groups, and jihadism have increasingly become the status quo. This pattern is not simply applicable to Syria and Iraq, it has been replicated in Afghanistan, Pakistan, Yemen, Libya, and the Caucasus. While these countries still have central governments, their capacity to control all their territories has deteriorated or collapsed entirely. This vacuum of political and socio-economic influence has been replaced by conflicting ideologies and groups who are intent on either destroying the government, operating with relative autonomy from state authorities or benefiting from instability and disorder. These groups also frequently fight each other, the insurgencies in Syria and Iraq and the blood-feud between ISIS and the Taliban in Afghanistan being the most recent example. Nevertheless these jihadists ‘rarely…have a notion of how to replace the state they are fighting‘ as exemplified by the intra-jihadist conflict between Jahbat al-Nusra and ISIS in Syria, the split between Bin-Laden and Zarqawi on strategy and tactics in the Iraq war and the infighting between Afghan jihadists and mujahideen after the deposition of the Najbullah regime. They still, however, have the capacity to be unpredictable either by seizing territories or resources or operating as vicious terror and guerrilla forces feeding off political grievances, violence, war economy, mafia networks, instability and state-actors willingness to utilise them as proxies for local and regional agendas. Afghanistan and Pakistan became havens for transnational and regional extremists, terrorists, and radical insurgents. From their base in Afghanistan, Bin Laden’s Al-Qaida was able to coordinate a series of attacks against its former ally, the United States. This eventually climaxed with the murder of 3,000 U.S civilians on 11 September 2001. There are startling parallels even if the context of the conflicts in Syria and Iraq are different. Vast parts of Syria and Iraq have fallen from state control to ISIS, Al-Qa’ida and Jahbat Al-Nusra and thousands of foreign fighters have joined the various and overlapping groups fighting with or against the Syrian and Iraqi governments. In addition, rebels and insurgent groups are being trained by Western actors and their allies as the latter wage a covert war in Syria. The CIA’s covert operations in Syria and Iraq are no secret, nor is it a secret that their operations are failing to inspire an insurgency group which is remotely moderate. According the Wall Street Journal (26th January, 2015) ‘entire CIA-backed rebel units, including fighters numbering in the “low hundreds” who went through the training program, have changed sides by joining forces with Islamist brigades, quit the fight or gone missing.’ The disintegration of the Hazzm Movement has been swiftly accompanied by the defection of CIA-trained rebels to Jahbat al-Nusra immediately after reentering the country (22nd September, 2015). Counterinsurgency absent a political or socio-economic solution, short-term power politics at the expense of long-term stability and a regional quagmire from which its military is unable to detach; Western policymaking in the region, contemporary and historical, has been a disaster. While the proliferation of the jihadist threat the Middle East should not be entirely blamed on Western policymakers (despite creating the conditions of violence which terrorists thrived on), the West underestimated how secular authoritarians would use anti-terrorism narratives to further entrench their violent security apparatuses. These terrorist and anti-government organisations, much like those which exist in Pakistan and Afghanistan, have operated with the connivance of various elements of the state in Syria and Iraq to deny power-sharing and undermine opposition groups. This is an undeniable reality of modern war, but Obama’s alternative to direct intervention was “to ramp up support for those in the Syrian opposition who offer the best alternative to terrorists and dictators.” Subsequently he requested Congress for $500 million to train and equip members of the Syrian opposition. As Patrick Cockburn contends “It is here that self-deception reigns, because the Syrian military opposition is dominated by ISIS, Jabhat al-Nusra, in addition to other extreme jihadi groups. In reality, there is no dividing wall between them and America’s supposedly moderate opposition allies” supported by Turkey and the Gulf States. The publishing of a document from the US Defense Intelligence Agency dated 12 August 2012 by Judicial Watch not only anticipates the rise of ISIS but seems to suggest it would be a welcoming prospect from the perspective of the international ‘coalition’ seeking regime change in Damascus. The consequences of promoting regime change have not just been damaging to Western security as exemplified by massacres in Paris, Brussels, London, Madrid, and the slaughter of journalists and Western tourists. The Middle Eastern wars are slowly degrading Western values and applied enormous pressure on the long-standing narrative that spreading liberal and democratic values are the fundamental core of Western values. Such a narrative is an illusion. We have slowly lost touch with the essence of war and become desensitised to the ramifications of recycling policies which have wrought death and destruction across the Middle East and in European and American cities. London, Paris and Washington must shift course as traditional allies become more unreliable. Their investment in the Syrian opposition and the regime in Baghdad has failed, their support for the Saudi-led coalition’s violent war in Yemen has exposed the hypocrisy of Western values, while Erdogan’s Turkish government has become increasingly volatile and unpredictable. Western policy has empowered enemies such as Russia and created a new Cold War between Saudi Arabia and Iran. The chaos created by the proxy wars of Pakistan, Turkey, and Saudi Arabia (not just Iran) has only threatened Western security and made it more enemies. ISIS and Al-Qa’ida’s elite must be fought, but ultimately our alliances and policies must be scrutinised if they continue to hamper security at home, upset regional balance, and produce global disorder. (by Matthew Williams)The Arab revolutions and the subsequent overlapping wars which have plunged the Middle East and North Africa into a fresh wave of bloodshed has catalysed a dramatic surge in jihadist violence across the region.